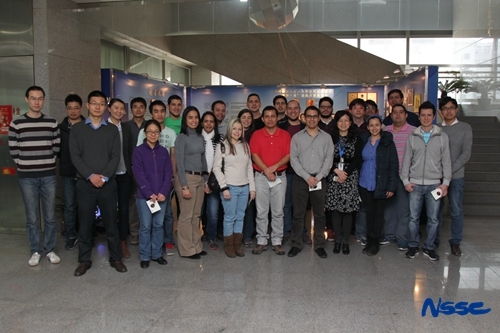 On the morning of March 25, 2015, a 21-person delegation of Venezuelan space agency visited NSSC. The delegation was headed by Mr. Mariano Imbert, the executive director of Venezuelan space agency. The delegation was invited to visit the Space Environment Prediction Center (SEPC) of NSSC. The scientific researchers at SEPC presented a brief introduction of SEPC and the relevant working experiences on space environment forecast and observation. Moreover, the related research accomplishments on forecasting model and space debris collision warning were also introduced. The Venezuelan delegation expressed the willingness in learning the research and operational experiences of SEPC and also showed the intention of bilateral in-depth cooperation when conditions permit. The predecessor of Venezuelan space agency was Venezuelan space center, which was founded in November, 2005. After its foundation, the Venezuelan space agency has collaborated closely with China on the mission of VRSS-1 satellite. The delegation of this visit was invited by the Great Wall Industry Corporation in order to further discuss the following cooperation on VRSS-1 satellite.